These are the updates for previous versions of CashNotify. Click here to see the new version of CashNotify. Changes how the app retrieves the latest currency exchange rates from Fixer.io. This is necessary due to these changes. Older versions of CashNotify will fail to fetch the latest rates. When you set up multiple accounts, the account drop-down list now indicates wether an account is TEST. This makes it easier to distinguish Live vs Test accounts. Fixed an issue where the Stripe account’s logo was not displayed. Because the logos are now cached locally, CashNotify will not automatically refresh the logos. 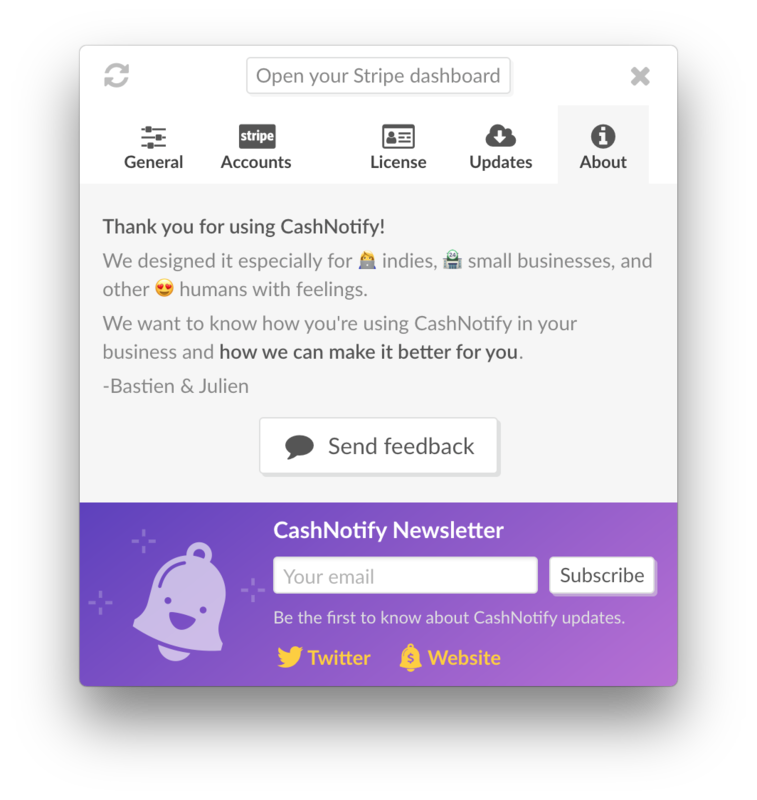 Whenever you update your logo on Stripe, simply restart CashNotify to refresh it in the app. We (sometimes) have bugs, and we’re grateful to our users for pointing them out (👋 Curt!). However, it’s always been difficult to debug, because we had to ask our users to open the logs and send them to us manually. To solve this problem, we have implemented automatic exception tracking (we use Sentry.io). This will allow us to proactively know when something is wrong with CashNotify, so we can fix it. That’s why we report only basic error information by default — no data about your Stripe account or transactions are sent. We try to tie error reports to email addresses whenever possible, for the sole purpose of contacting you to request additional information, should we need them. This will add additional data to the exception logs. Depending on the bug, this data may contain confidential information, such as transaction amounts, bank names, payment ID, and so on. However, API keys and customers’ email will never be shared, as they’re redacted. In any case, we strongly believe in the confidentiality of the data and we will never do anything with this data, will share it or exploit it, once they have helped us to solve the problem. Feel free to talk to us if you have any question about this (or anything else, really). We fixed an issue where a refund event, when formatted unexpectedly, would prevent all events to be displayed at all. 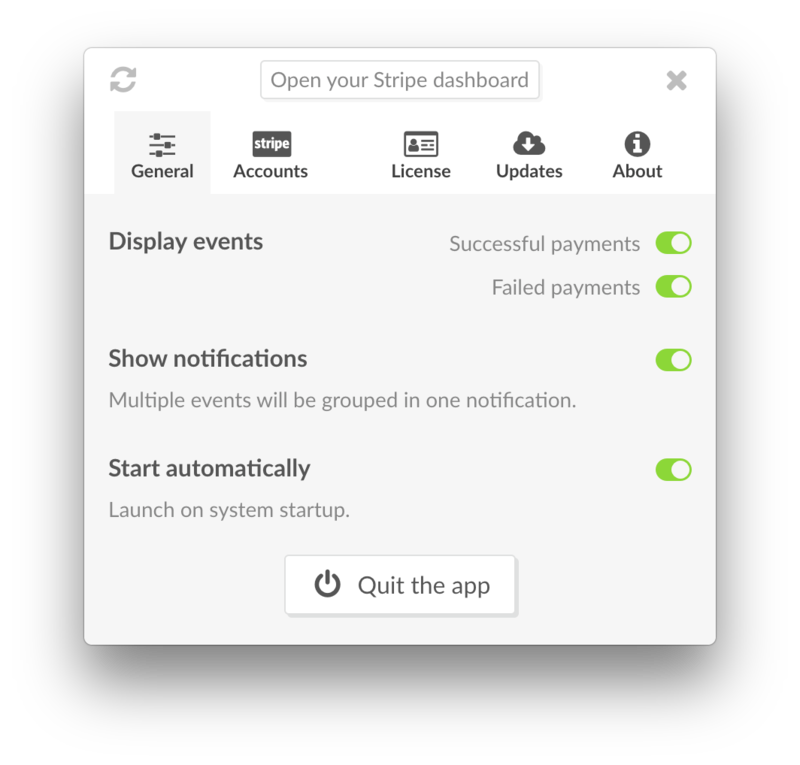 If CashNotify does not display any event for a specific account, and your Stripe account is already several years old, this should resolve it. Read more about what motivated this release: A Better “Net Revenue” Indicator. We’re adding fee details on payments and refunds. 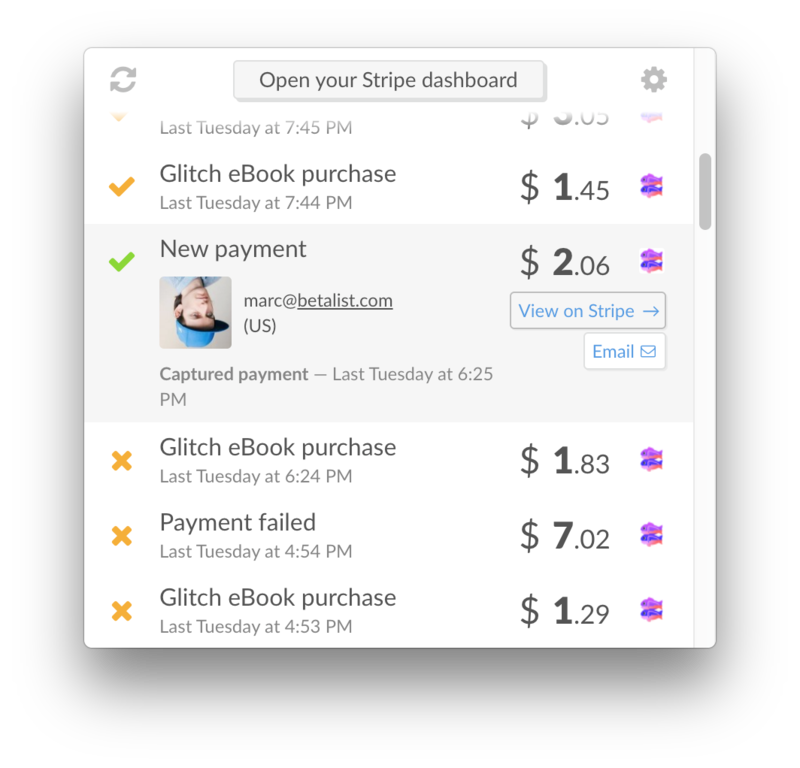 It’s especially helpful when Stripe converts the amount paid by your client into your account’s currency. We’re adopting the same “net” definition as Stripe by excluding fees from our graph. The graph now reflects what will be transferred to your bank account. Graphs on 1 and 4 weeks now have the same number of points than similar graphs on stripe.com. We changed our Apple Developer ID, which means the app certificate signature changed as well. The only visible change for you might be that CashNotify prompts you again to accept rights to read the CashNotify key in your Keychain. You need to accept, that’s normal. Add a new 4w option to the dashboard. Actually we chose 28 days (4 weeks) because that’s what Stripe did on their new web dashboard. For more details, see full thread with Pieter. We also added an error message if you try to use a Stripe Restricted Key. CashNotify is not yet compatible with them, even though we’d like to. We wrote about it here. 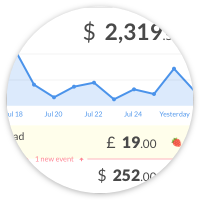 CashNotify 2.4.3 brings revenue dashboard (+ the easiest way to share beautiful, Retina-ready pictures of your dashboards! ), account filtering, refunds, and proper English number formatting. Here is the changelog since last stable version 2.3.1. 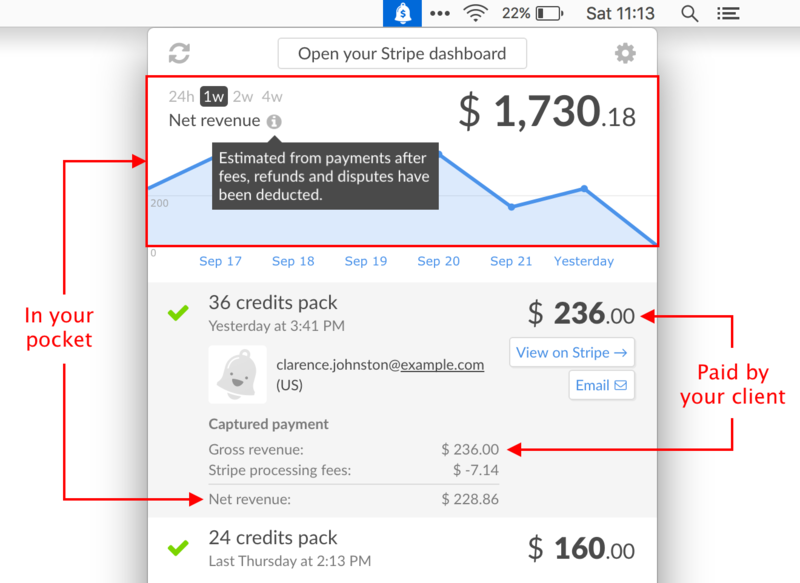 View total revenue across all your Stripe accounts on the new dashboard. We’re displaying gross revenue, minus refunds and dispute amounts. You can choose from 3 timeframes: last 24h (particularly useful to follow along a launch), last 1 week and last 2 weeks. “Drag to share” to quickly share a screenshot of the revenue dashboards. View refunds. This is disabled by default, you can enable it from the Prefs. Quickly filter events by accounts. Reduce risk of timeouts when fetching data (events, transactions, plan or bank names) by giving them different priorities. Use English number format, with a comma for thousands separator. CashNotify 2.3.1 brings customer details + actions, fraud alerts, and 2-steps payment flow support. Here is the changelog since last stable version 2.2.1. Click an event to expand it and get more details about it. Get to know who’s your customer with her gravatar (or her company’s logo), and email her directly from CashNotify. Flag payments which triggered a fraud alert, so you can review them. Note: not reviewing a flagged payments has no malus: you’ll still get the money by default. However, it’s good practice to review it: should you detect anything wrong, you can refund it without any penalty, before the payment might be disputed (which involve both a lot of time spent and a potential chargeback). Ignore charges until they’re captured. Some businesses use a 2-steps payment flow, where they first pre-authorize a charge, then capture it up to 7 days later. E.g. BetaList captures your payment only after your startup has been reviewed. CashNotify now makes the difference between pre-auth’d (a.k.a. uncaptured) and fully captured charges. If you don’t use this, nothing will change. All your successful charges will still be displayed in CashNotify. pre-authorized charges, not yet captured, will NOT be displayed anymore. Previously they were displayed as successful charges. pre-auth charges will be displayed as soon as they’re captured, at the date of capture — not the date of pre-auth. This means that uncaptured charges are ignored altogether. We assume that businesses who chose Auth & Capture flow already needed some way to capture charges, so they would have a way to be notified of charges to be captured. If you’re doing otherwise, please tell us! Add icon types in Prefs to make it easier to understand. Fix an issue where events with exact same timestamp would be displayed in random order. Fix an issue brought in previous Pre-release 2.3.0-beta, where some events would randomly not be displayed until the app is restarted. Let us know what you think @CashNotify! This 2.2.1 release brings payouts to CashNotify, as well as a big performance improvement, with x2-x4 less CPU load on average. View your paid and expected payouts. Expected payouts are payouts already created by Stripe, and which will reach your bank account soon. This delay can vary from a few hours (for automatic payouts on US accounts), up to a few days in other countries. Added more details about a failure in the tooltip. Added a 🔁 icon, so you can visually tell the difference between one-off vs recurring subscriptions. 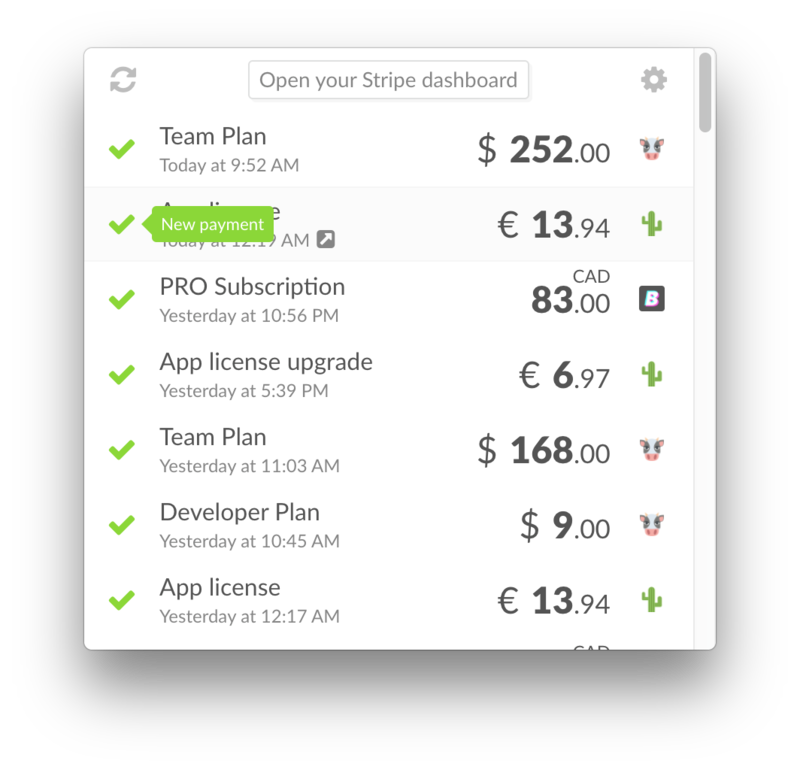 Make “Open your Stripe dashboard” button looks more like a button. Accept old Stripe API keys (the vintage ones, not starting with sk_). Performance: CashNotify will use a lot less CPU overall. It’s especially noticeable if you let CashNotify always run in the background (as it’s supposed to be). “Display events” preferences are now saved and will be set on launch, instead of enabling everything by default. Some accounts with a lots of events could timeout when being refreshed. We increased the timeout to 20s to help with this situation. DMG image gets back a proper retina background. 🔥 This is the official release of v2, yeah baby! 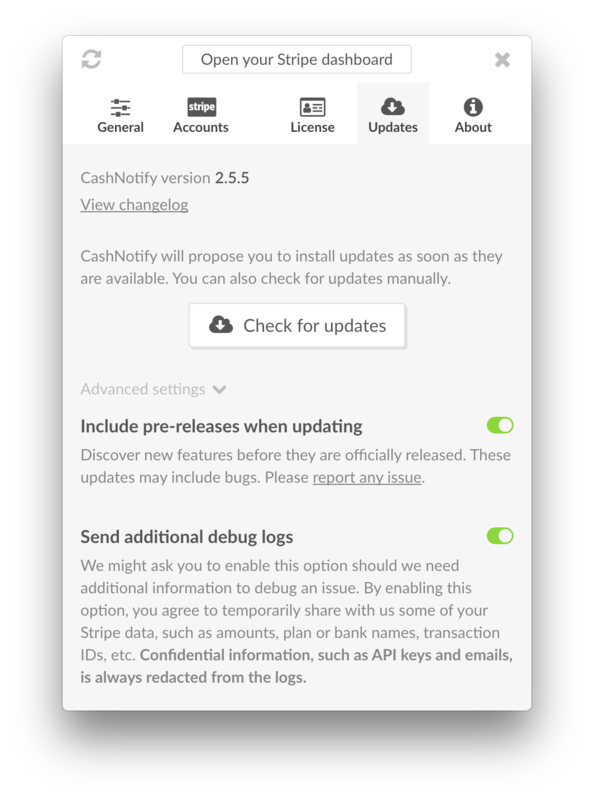 CashNotify will automatically prompt you to update to the latest version (v2.1.1) next time you launch it. 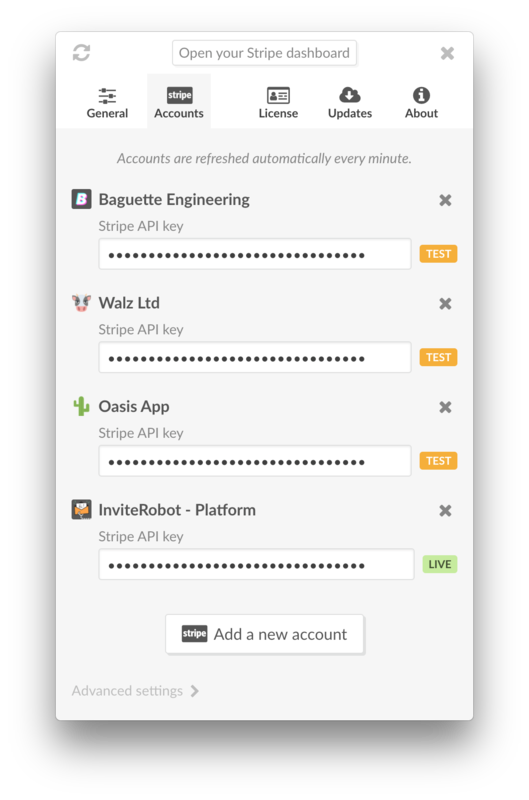 Multiple Stripe accounts support: view all your Stripe accounts in 1 single interface, including your TEST/LIVE accounts! Add more context to each notifications, including plan name if it is about a subscription. New Preferences screen, with new filters: choose which notifications you want to display or hide (successful or failed payments). Gracefully handle Internet connection / disconnection. Add some emojis in the About tab. That’s very, very important. Made it explicite that accounts are being refreshed automatically every minute. Some pixel-level alignement fixes, which we’ll probably be the only ones to see. We feel better though. Fix window not properly resizing on opening/closing Preferences. Fix FOUC (Flash Of Unstyled Content) at app startup. Fix content flickering when switching tabs in Preferences. This was due to some strange behavior of the scrollbar. We’re hard at work on bringing you the most requested features. 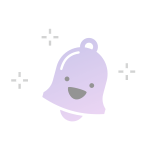 To get smoother updates out there, we intend to release small and often. Part of this process will involve optional updates, which we’ll call our Beta channel. Starting from 1.0.1, you can opt-in to get Beta versions as part of your updates. We intend to ask for very specific feedbacks, so the setting is — on purpose — not easily visible. Auto-updater will only check stable channel by default. A new option is added to opt-in to beta channel. CashNotify is now considered stable, and for the occasion is upgraded to v1! In-app checkout has been removed, as there is an issue when checking out with Paypal from an in-app browser window. It has been replaced with links to online checkout. The ‘Report an Issue’ link was useful while in Beta. It’s been removed.